Hi! How is everyone today? A 4 day long weekend for Easter is what a lot of folks celebrate. I won't be for all the days since there's still work to be done but I did take some time off today! 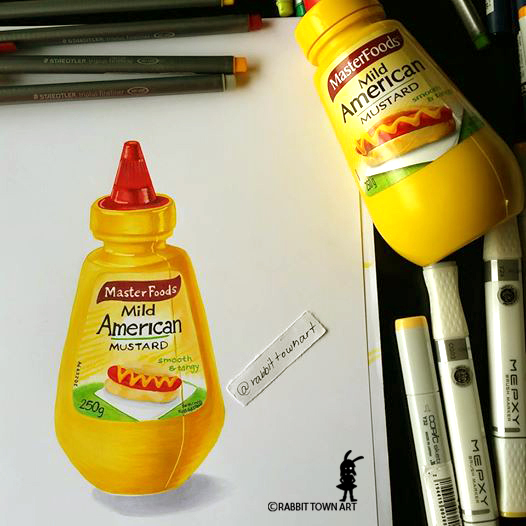 I spent most of today chilling and drawing which was lovely and drew this bottle of mustard that I actually started about a week ago and we're going out to nice place tonight for dinner...difficult to find places open on a Good Friday but we have one! I am about to start some work before we head out though. I can't help myself to take the entire day off when there is stuff to do and I will feel better if I at least get a design or two done. Only have an hour before we leave though! Tomorrow, I will draw something more "Eastery". Hope everyone is have a great day!